Learn about the best in corporate network monitoring software. Record and log everything your employees do - from recording employee keystrokes typed and website visits, to chats, employee emails and screenshots. Remotely control employee workstations. An invisible, stealth monitoring tool, NetVizor gives you one-click access to viewing everyone on your entire network in realtime - from one central location. With a single click you can view the desktops of every workstation on your network, in realtime. Alternatively, you can use NetVizor's activity ticker to view a constantly-updated list of all computers on your network, showing what users are logged in, and what windows they are working with. NetVizor's logging capabilities are virtually limitless. NetVizor can log keystrokes typed, application and website usage, detailed file system usage, incoming and outgoing chats and emails, windows interacted with, desktop screenshots, internet packet data, software installations, internet connections, and much more. All activities logged can be tied together and presented in easy-to-read graphical reports. NetVizor has built in remote administration features that allow you to remotely control remote workstations. NetVizor allows for remote workstation security auditing, remote application and windows management, file system browsing, system lockdowns, activity log viewing, reports generation, and more! 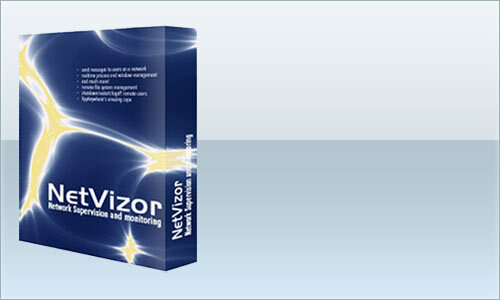 NetVizor employee monitoring software not only acts as a powerful network monitoring software solution, but also as a content filtering tool. NetVizor can filter websites from being visited by your employees, applications from being ran by the worker, and even chat messengers from being used while NetVizor is active. NetVizor can then email you when specific alerts have been triggered by your employees. Ready for Windows NT, 2000, 2003, XP, Vista, Windows 7, Windows 8, Windows 10 and Server. 32-bit and 64-bit supported. "I wanted you to know that I tried 3 different employee monitoring software packages for my network and yours is absolutely the best. I have already recommended it to 3 other system administrators who were looking for such a product. The interface is amazingly easy and intuitive and exceeded all of my expectations"
EmployeeMonitoringSoftware.com © 2007-2016. All Rights Reserved.